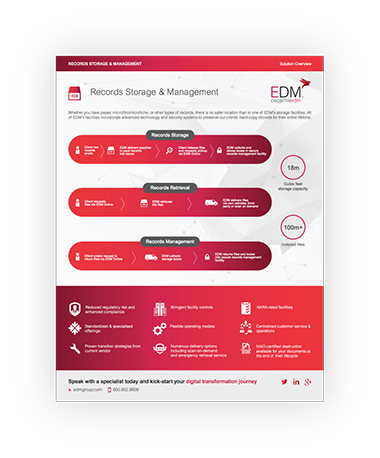 Download our Records Storage & Management Fact Sheet and discover the benefits of paperfreedm. EDM Group is a trusted provider of digital Information Management services to the Healthcare sector across the US. Whether you have paper, microfilm/microfiche, or other types of records, there is no safer location than in one of EDM’s storage facilities. All of EDM’s facilities incorporate advanced technology and security systems to preserve our clients’ hard-copy records for their entire lifetime.